The company’s activity related to the distribution and commercialisation of products entails a high level of consumption of energy sources and materials. Accordingly, the technical, supply chain, and product development teams actively work to continuously improve the company’s facilities and procedures, and in 2017 they managed to avoid the release of 7,786.88 tonnes of CO2 into the atmosphere (305-5), and a reduction in the use of materials that amounted to -1,074,461kg; 5.5% less, despite the increase in plastic consumption (301-1). The environmental budget associated with the adoption of these measures amounts to 17,838,211€. 1 Given the impossibility of quantifying consumption of the last month of the year at the time of writing this report,consumption/emission from company cars and business trips data corresponds to the twelve-month period December 2016 –December 2017. 2 (305-6) Reported gas details: R134A, R290, R404A, R407A, R407C, R410A, R417, R422D, R449A, R507A and R22, which correspond to a total 1.32 metric tones of CFC-11 equivalent from R-22 gas. Data corresponds to the tweleve-month period December 2016 – December 2017 with the exception of Portugal (store consumption corresponds to January 2017- December 2017; wharehouses December 2016 – December 2017). The DIA Group has been a pioneer in the introduction of energy efficiency systems in stores, and has been working for over a decade on three main improvement areas: freezer and refrigeration systems, air conditioning, and lighting. The DIA Group’s stores have condenser batteries to offset energy consumption. Savings of 77% in energy consumption are achieved by using freezer cabinets with sliding doors, variable speed compressors, and propane as a freezing agent. Moreover, the “free cooling” systems make use of outside air to achieve the desired temperature inside the store, the use of floating condensation systems in the central refrigeration unit, and the installation of automation control boxes. The latter, in addition to offering the intelligent control of the air conditioning, adapt interior and exterior lighting according to work timetables and natural light coming in from outside. Several energy improvement projects were carried out in 2017 in the company’s stores and warehouses in the countries in which DIA has a presence. Of these improvements, we highlight the closing of cold cabinets in the stores in Brazil, the use of electronic valves in Argentina, and the use of more efficient fans in Portugal and Spain. In total, these improvements have saved 18,620,630 kWh equating to 5,58.2 tonnes of carbon dioxide. Despite the progress made in terms of in-store eco-efficiency, the DIA Group continues to test the most innovative systems that appear in the market in what are known as “eco-sustainable stores”. These are pilot stores where the operation and efficiency of new measures are verified, such as the use of new coolants and the use of dual air curtains in the doorless wall cabinets, before they are rolled out to the rest of the store network. With these sustainable measures implemented in stores and warehouses, at a constant surface area, the company has generated accumulated energy savings of up to 25% compared to previous systems, which equates to a reduction of 20 tonnes of CO2 emissions released into the atmosphere for each store (302-4). Moreover, it is estimated that the emission of an additional 996 tonnes of CO2 into the atmosphere was avoided thanks to the increased use of videoconferences and the promotion of shared transport systems. 100% of the DIA, Maxi DIA and La Plaza stores have energy efficiency measures in place, such as systems to improve the efficiency of its refrigeration units, LED lighting, and automation systems for the intelligent rationalisation of energy consumption. 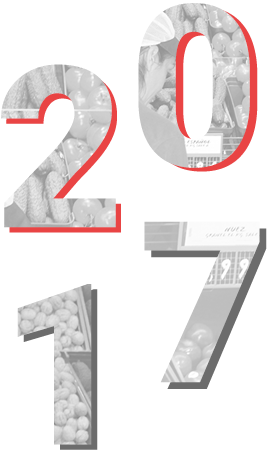 3 Estimated annual savings from new measures implemented in warehouses and stores in 2017. According to data from the European Environmental Agency, logistics operations are responsible for 25% of CO2 emissions in Spain. Given that the DIA Group is aware of the impact that these activities have on the environment (with daily deliveries from its 38 logistics centres to over 7,300 stores), it is constantly striving to improve its environmental footprint through projects that allow it to optimise the logistics processes. Specifically, the company has renewed some of its fleet, with 30 new vehicles with lower fuel consumption and that are compliant with the most recent Euro 6 emissions standards, the use of high-capacity combined trucks such as mega trailers megatrailers and the use of hybrid trucks, have led to fuel savings of 448,715 litres and more than 1,200 tonnes of CO2 that are not released into the atmosphere. Despite these improvements, the overall fuel consumption of primary and secondary transport has increased by 2%, due to the increased frequency of deliveries demanded by the new commercial models. However, the company’s commitment goes further than that, with a target of an additional 20% reduction in energy consumption over the next five years. This is the objective of Lean&Green, an interprofessional European initiative, and its Commission is presided over by the DIA Group. As part of this initiative, companies must present an action plan with the initiatives that they intend to implement to reduce emissions, and the level of compliance will be audited by an independent company. The growing digitalisation of processes allows DIA to make great strides forward in reducing paper and toner consumption in its offices, warehouses, and stores. In addition to the setting up of online process management system (BPMS - Business Process Management Suite), the company has digitalised its loyalty coupons, which has been very well received by customers. These two initiatives led to an estimated saving of 200 tonnes of paper in 2017. In fact, since 2015, in Spain, the company has saved almost 8 million kilograms of paper that were used to print advertising leaflets. For yet another year, the DIA Group’s experience in optimising its packaging, ready for sale, and applying eco-design techniques, has allowed it to obtain both quantitative and qualitative improvements in this area, optimising the consumption of raw materials and reducing the company’s environmental impact. 4 Given the impossibility of quantifying the energy consumption of the last month of the year at the time of writing this report, data from Artentina and Spain corresponds to the twelve-month period December 2016 – December 2017.